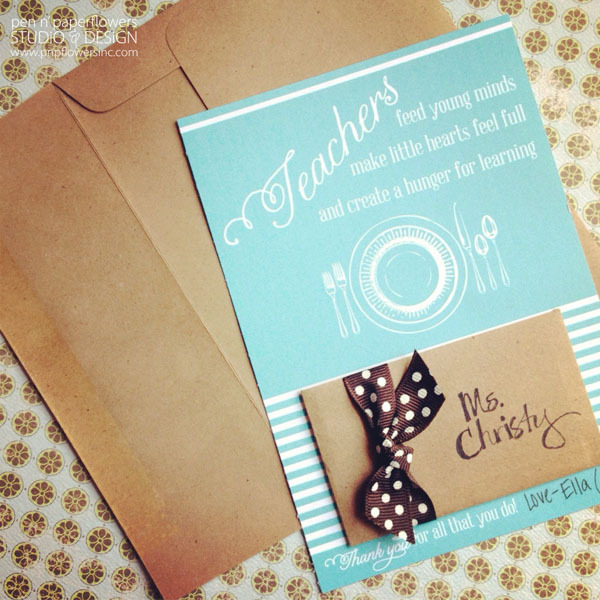 Looking for a last-minute Teacher Gift Idea? How about a last-minute Classroom Party Treat Idea? Includes a spot for a Gift Card built right in. And this adorable FREE printable by my friend +Kori Clark from Paper & Pigtails is the perfect combination of the two. BUT it was also heartfelt because I absolutely LOVE the message of "feeding young minds, making little hearts feel full and creating a hunger for learning". And it's brilliant how the reference to feeding/eating makes the card perfect for presenting a Gift Card to a local restaurant. The kraft envelopes shown are leftovers from a stash of envelopes I purchased about 7-8 years ago. Want a cute, simple idea for classroom party treats too? Here's another FREE printable I used, from one of my fave craftinistas, Lisa Storms. 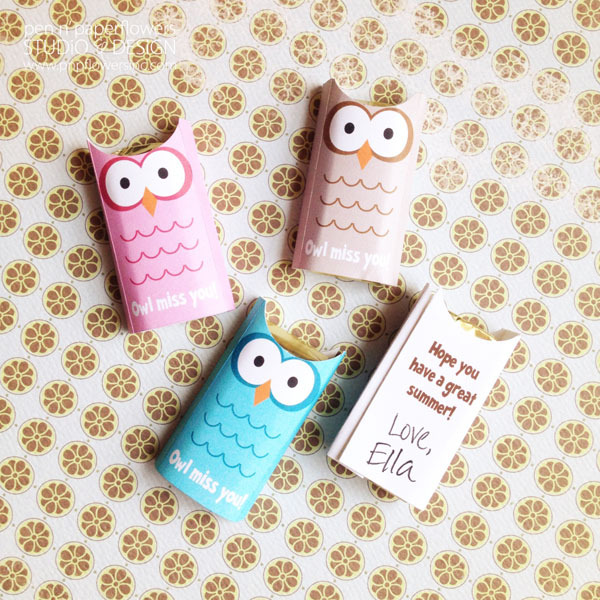 "OWL Miss You - Mini Hershey Candy Bar Wrappers"
Second, because I didn't have to design them - just print, cut and glue. Third, because they were little enough for Ella to personally handout/deliver to each of her classmates after her Pre-School Graduation Ceremony yesterday. I NEEDED simple and easy. Seriously one of the craziest, busiest weeks I've ever had as a parent. End of school year performances, celebrations and a pre-school graduation. We are all going through that, right? Not so out of the ordinary. My oldest daughter's 17th Birthday. She enjoyed a birthday breakfast and went to school. I was called 2 hours later to come pick her up after she sliced her finger in Science class and passed out. She rested up a bit, wrapped up her finger and finished up her school day. No birthday dinner or dessert that night due to TWO different school performances she and her sister had to be at. I attended Clara's performance at the High School. Ema and her dad attended her performance at the Middle School. We arrived home at 9:30 p.m. I just didn't realize how busy it was going to be. I was able to work some in the morning and then after picking Ella up from pre-school, she and I proceeded to start making the Turtle Cheesecake for Clara's birthday we would be celebrating on Thursday night. I had just finished making the crust and whipping up the filling when I received a phone call from a schoolmate of Ema's. He tells me Ema has a bad cut and needs to go to the hospital? I seriously thought it was a joke due to Clara's incident the day before. The boy on the other end of the phone politely responded, "No ma'am. This isn't a joke" when I questioned him. I arrived at the Middle School not really sure what was going on. We ended up at our doctor's office where she received 5 stitches on her thumb. I managed to arrive home to grill up the chicken I started brining 3 hours prior and then made a double-batch of Homemade Creamy Italian Dressing. I was determined to still make it to a Whole30 themed church potluck that night. We ended up being about 15 minutes late and that was really because I was also baking the cheesecake I never got to finish before receiving the frantic phone call earlier that day. I ended up volunteering last-minute at the High School concession stand. I arrived home at 11:00p.m. as well as the opportunity to actually light the candles on the 3 day old birthday cheesecake and sing Happy Birthday to Clara! I actually feel pretty fortunate to have been able to avoid stitches for any of my kids for so long. After this week, Ema is my first child to have gotten them. No tears the entire time!! (Meanwhile I was on the verge of passing out and had to go lay down in another room 1/2 way through the stitching). I felt so lame - But I seriously felt SO sick and woozy. I'm proud of my girl!